Shin Megami Tensei: Devil Survivor belongs to the highly popular series and opts to mix several genres together to create a tactical role playing like experience. With multiple endings and paths to take throughout the story combining with so many different team setups it’s a game with high replay value. Set in modern day Tokyo the game explores the struggle of a teenager and his friends as an outbreak of demons consumes the city. These demons take part on both sides of the game though with some deciding to join your side which is where much of the game depth comes from as you choose your favourite demons and even fuse them together to create new demon breeds. Gameplay combines heavy exploration of Tokyo while outside of battle with impressive tactical role playing elements which develop as the game progresses. This exploration is used to drive the story, discover additional information or simply take part in battles to refine your team skills. Core of combat though involves individual scenarios with a given objective (defeat all enemies, protect a certain unit or stop an enemy from escaping). Your team is made up of small squads which each consist of a leader and two supporting characters (demons). If a team leader becomes incapacitated though the entire squad becomes useless even if the supporting characters have health to continue the fight. The enemy works in a similar fashion with squads that can be taken out of action by ensuring the leaders demise. Each turn players can move their squad and order them to attack while individual members can combine this with healing, buffs or summoning additional squad members to the fight. Advancing your swards is done as expected with experience points being awarded for your efforts and then combined with game currency to be used on all sorts of items and additional demons. 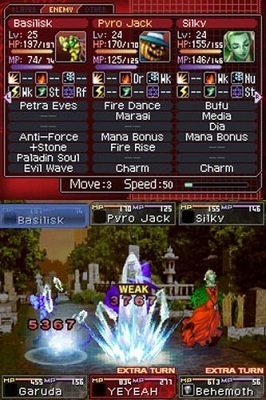 Players can even learn skills from the enemy using the unique skill cracking mechanic that requires careful precision and planning to ensure success. 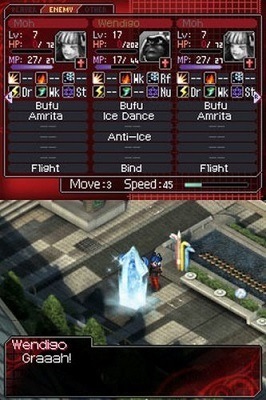 The high quality offering of Shin Megami Tensei: Devil Survivor is not only enjoyable for the first playthrough but the many subsequent adventures you’ll take to experience everything this game has to offer. Lead your squads of humans and demons into tactical combat. Recruit new demons and fuse them together for new allies. Develop your characters as you desire and learn new skills through skill cracking. Explore a shattered Tokyo in between battles.